But how are you to know if your soil is healthy? One trick to get you started is simply to soil your undies. 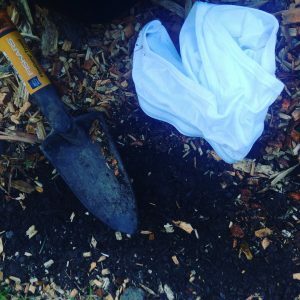 The soil your undies challenge does the work of measuring the biological activity of your soil for you! Step 1: purchase a pair of 100% cotton underwear. Boxers? Briefs? You choose! Step 2: Select a site in your garden that can remain undisturbed for two months. Dig a hole and bury the underwear! Step 3: Two months later, carefully dig your underwear back up. Take a look at it—is it fully intact? Is the only part left the elastic band? 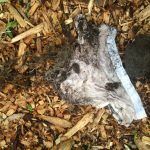 The more damage done to the underwear, the higher the biological activity in your soil! If you find that your underwear displays hardly a blemish, your biological community is underperforming. Do not fret! If the season allows, try planting a cover crop! Legumes will put nitrogen into your soil with the help of beneficial bacteria, and grasses will add organic matter through their root systems. Plants with a deep taproot, like Daikon radishes, will break apart dense soils allowing them to better absorb water. Harvest the cover crop before it produces seeds, and then leave the dead plant material in the garden bed. It will decompose, adding even more organic matter and nutrients into your soil. Alive or dead, a cover crop is a great way to feed your soil biome. And if you find that your underwear has all but disappeared? These tricks are for you too. Healthy soil does not maintain itself, and by utilizing tactics such as a cover crop, you can ensure that you retain the healthy soil that you have already worked so hard to build. 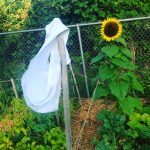 Take a look at these photos from my community garden. 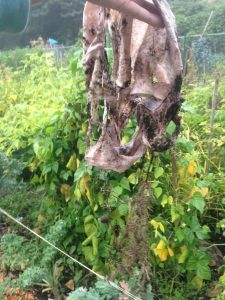 A fresh pair of 100% underwear ready to be planted in my community garden plot. Identifiable…but not exactly good as new! As you can see, the underwear is in poor shape, but still recognizable. I have planted a cover crop mix of winter wheat, Austrian winter peas, red clover, and icicle radishes. I look forward to trying this activity out again in the spring, and hopefully improving my results! 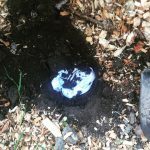 This activity was a great way for me to test the biological activity of our soil, and to build awareness for soil health among my fellow gardeners. It is also an excellent activity for schools! 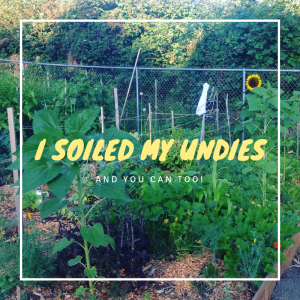 Whether your school is home to a garden or more traditional landscaping beds, you can soil your undies and test the biological activity of your local soil. Consider trying this out in multiple garden beds and/or landscaping areas. Encourage students to make predictions. Based on what they already know about their soil, or are able to observe, what do they think the underwear will look like in two months? Then, have them compare the results with their predictions! Students will have a hoot, you’ll get useful information about the health of your local soils, AND you and your students will utilize the NGSS science and engineering practices. Sounds like a win-win situation to me!